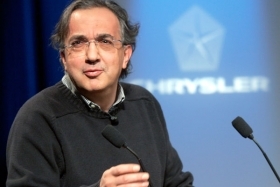 Sergio Marchionne, CEO of both Fiat and Chrysler, wants to boost Fiat's stake in the U.S. carmaker to more than 50 percent before a Chrysler IPO. MILAN (Bloomberg) -- Fiat S.p.A. raised its stake in Chrysler Group LLC to 25 percent after the U.S. automaker met the first of three performance-related targets. The two other milestones that will allow Fiat to increase its stake in Chrysler include meeting sales targets outside North America and the commercial production in the U.S. of a 40-mile-per-gallon vehicle based on Fiat platform technology. Fiat, Italy's largest manufacturer, won the first additional 5 percent after Chrysler received regulatory approval for an engine based on the Fiat FIRE family for manufacture in U.S., the company said in a statement on Monday. Chrysler confirmed the increase in a separate statement. Fiat received a 20 percent stake in Chrysler as part of the U.S. carmaker's 2009 bankruptcy reorganization. It expects to get an additional 15 percent this year when Chrysler meets goals including some sales objectives outside of North America. Chrysler said in October that it planned to begin producing the Fiat-derived, four-cylinder engine in November at the automaker's engine plant in Dundee, Michigan. The first North American application of the 1.4-liter FIRE engine with the so-called MultiAir Technology will be in the new Fiat 500, which “Chrysler Group will begin to distribute soon through newly appointed dealers,” Chrysler said today. Fiat has an option to boost the holding to 51 percent, after Chrysler repays U.S. and Canadian government loans. Sergio Marchionne, CEO of both carmakers, said Jan. 7 that he'd like to pay back the U.S. and Canadian government loans received during Chrysler's restructuring this year . The face value of Chrysler's debts to the U.S. and Canadian governments is about $7.46 billion, according to the U.S. carmaker's third-quarter financial statement. The CEO reiterated on Jan. 3 that Fiat may boost the Chrysler stake to more than 50 percent before an initial public offering of the U.S. carmaker in the second half of 2011.